Each pen contains our concentrated Pure White Ink and will allow you to create consistent, bright, and vivid messaging and displays. Our unique 3mm rounded tip provides fine lines without breaking down. Use on menu boards, retail displays, solid chalkboards and blackboards, glass, windows, mirrors, and other non-porous surfaces. IMPORTANT: Please test your surface with water prior to use to ensure that it is non porous. 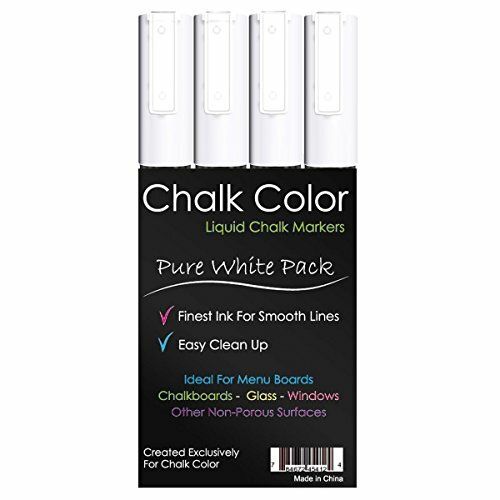 If the water is not able to be wiped away leaving the surface completely dry within a minute your surface may be porous and you should not use chalk markers. Chalk markers should not be used on unsealed, painted surfaces. Chalk boards with backings made from wood, particle board, drywall, or other porous surfaces should be avoided. You are completely protected by our 60 day, no questions asked, satisfaction guarantee. See the SPECIAL OFFERS Section for additional savings. Click the add to cart button now! ARTIST QUALITY - You deserve the highest quality chalk ink and the most durable fiber tips available. This is what you will get when you purchase our 4 pack of Pure White Liquid Chalk Markers today! 3MM ROUNDED PRECISION TIP - is unique to Chalk Color and will provide you with a fine, precise line and will not distort or dry out. The water based chalk ink will flow effortlessly from the durable fiber tip and provide you the best balance for precision writing as well as for your arts and crafts. ENVIRONMENT AND ALLERGY FRIENDLY - Great alternative to chalks because they are dust, odor, xylene free and non toxic. These wet chalks are the perfect option for kids and the child who may suffer from allergies and asthma. USE ON - solid blackboards, whiteboards, dry erase, windows, glass, mirrors, kitchen canister labels, paper, stencils, scrapbooking, restaurant menu, and retail advertising displays. Ideal for your home, office, or for educational puposes in the classroom. Your purchase is RISK FREE due to our 60 day, no questions asked, money back guarantee. You SHOULD NOT use chalk markers on un-treated, painted surfaces including chalkboard surfaces that are painted onto wood or a particle board backing. Always test your surface with water prior to use. If you have any questions about this product by Chalk Color, contact us by completing and submitting the form below. If you are looking for a specif part number, please include it with your message. Color Liquid Chalk Markers - Extra Wide 10mm Tip - Neon Fluorescent Colors. Reversible Tips. Mega 8 Pack. Chalkboard - Glass - Tile - Plastic - Metal - Posters.